This post is totally unrelated to anything having to do with school–although, these would make a nice treat for breakfast or an afternoon snack after school! 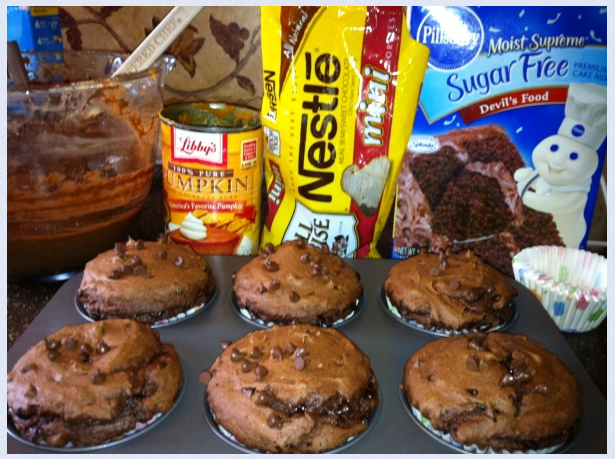 I found this recipe on Pinterest for Weight Watchers muffins and decided to try them–they are supposed to be 1 point each. I made them today and they are GOOD!! You cannot taste the pumpkin AT ALL! I’m not a big pumpkin fan, but you wouldn’t know it was in these muffins. You just replace the oil, water, and egg with the pumpkin and you’re set! They do bake up a little funny because they are dense (as the recipe says), so they will look odd, but things don’t have to look cute to taste good right? Posted on September 2, 2012, in Pinterest, Pumpkin. Bookmark the permalink. 2 Comments. Are the mini-muffins one point or the big ones?